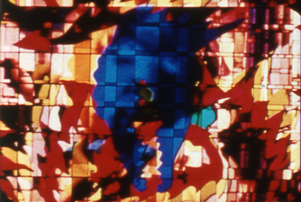 Early in Alternative Projections we presented Early Abstractions of the 1940s and 1950s, which presented an evolution of imagery in films from abstracted sculptural shapes to abstract images created by animation and optical printer. 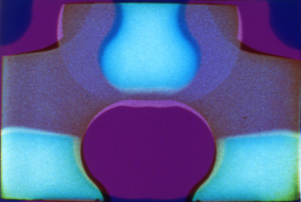 We continue looking at the evolution with more remarkable abstract films. As in the earlier show, John and James Whitney continue as key figures, but working separately. John Whitney’s 1967 Experiments in Motion Graphics introduces the possibilities of computer animations, soon to be fully explored. 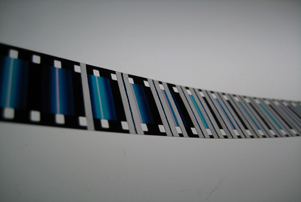 The classic films 7362 by Pat O’Neill’s and Kitsch in Synch by Adam Beckett reveal some of the unbelievable possibilities of optical printer work. 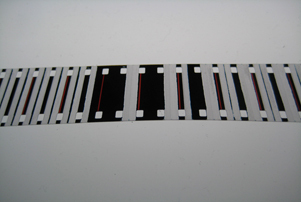 Jules Engel’s Train Landscape uses traditional animation. 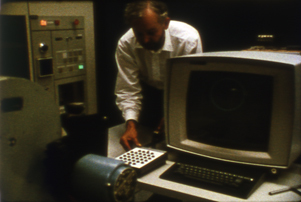 Michael Scroggins worked with pioneering video manipulation. And then the age of the computer was upon us. Newly restored print from the Academy Film Archive! 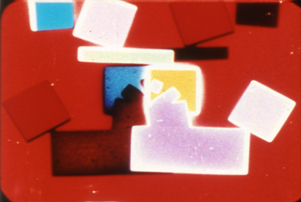 Developed from a talk he had given in Aspen, Experiments in Motion Graphics is a fascinating and unique film document in which John Whitney explains the technical and creative processes behind the creation of his pioneering computer animation work (in this case, the classic Permutations). “This Film started out to be about the motion and sound of the oil derricks that once lined the beach in Venice, California. The derricks, which had been built during the oil boom of the 1920s, were made of wood and rusted iron, and were largely open and unattended. I was attracted to these towers by their moaning sounds, their heady aromas, and the consolation of the endless rising and falling of the pump heads. Somehow it seemed like prayer. The film came to contain a human body, and then moving objects which I filmed in my studio: rotating and oscillating shapes whose outlines would merge with one another. But in a way the piece was really about re-photography – about making something out of ordinary parts using mechanical technology to reveal a glimpse of something uncanny. One of John Whitney's late masterworks, this restrained, powerful computer animation piece is set to Terry Riley's 'Poppy Nogood and the Phantom Band', from his A Rainbow in Curved Air album. Restored print courtesy of The iotaCenter/Academy Film Archive. Print courtesy of Louis Hock and the Academy Film Archive. Though fully shot and roughly assembled by James Whitney prior to his death in 1982, this film – third part of an intended quartet – was completed and printed after his passing by William Moritz and Mark Whitney.